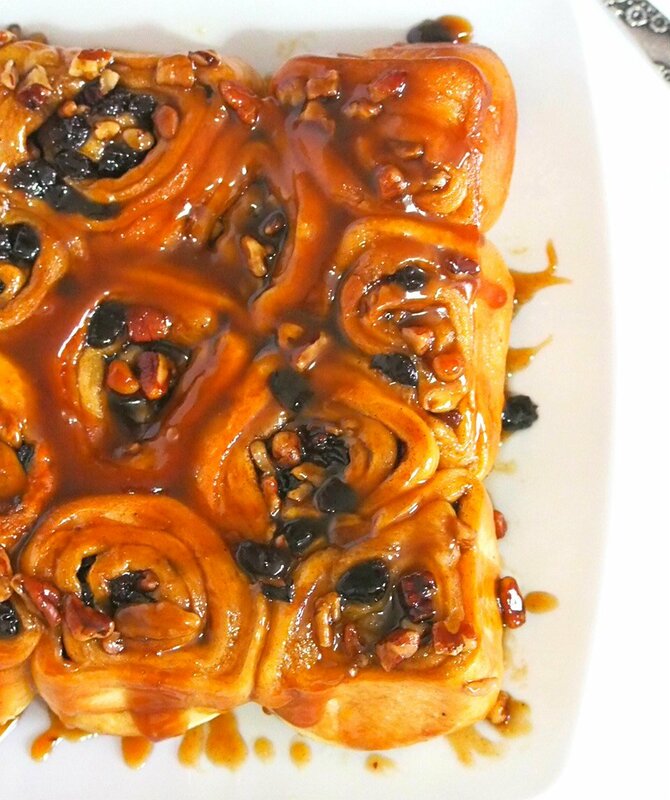 These sticky buns are loaded with pecan nuts and raisins and covered in a sweet and sticky brown sugar topping. These are the ultimate cinnamon rolls using brioche dough that is packed with flavorful cinnamon sugar filling. At the very core, these sticky buns are cinnamon rolls that get a total upgrade by the addition of pecan nuts, raisins soaked in rum, and the best part, the gooey, sticky brown sugar topping. If you ask me, the sticky brown sugar goo is my favorite. And also the pecans. Oh and the raisins. It is hard to decide. 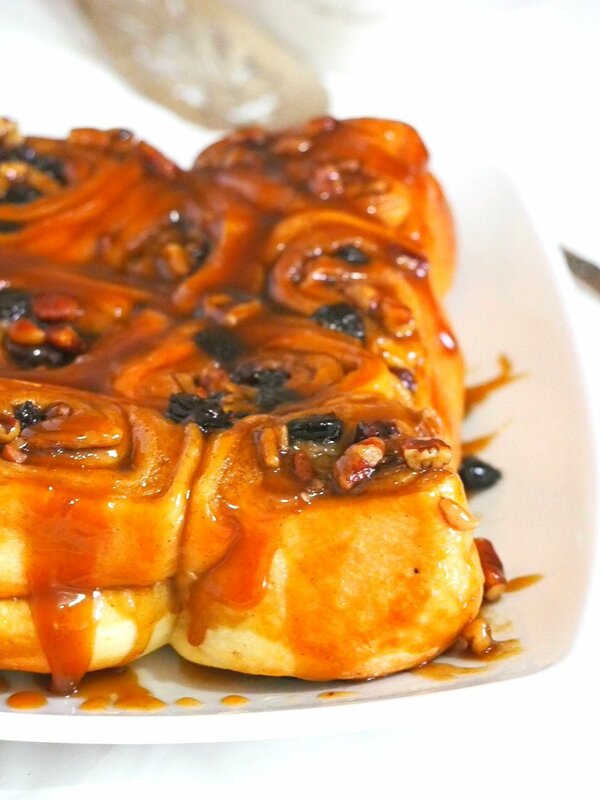 The truth is, these sticky buns are complete parcels of goodness. You will surely love each and every element in it. What is more special about these is that they are made of brioche dough. Yes, the buttery, fine and soft brioche gets all these wonderful add-ons to make the ultimate, most glorious sticky buns. This brioche recipe is my favorite, my go- to recipe that never fails. 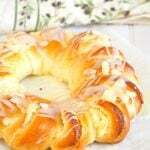 I made brioche braid with it. I made chocolate filled buns and the pretty cream cheese brioche. All these using the best brioche recipe that I have ever known. And today, we have these sticky buns to add to the delicious line up. Now you might say, “I love sticky buns but to go through the laborious process of making brioche? No Thanks! Trust me, you really have to go the extra mile and make the brioche. They make such a difference. And the thing is, making the brioche is not a hard labor as you might think. 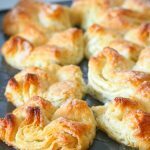 And you actually save time when you make it and here is why: The brioche recipe makes a big batch of dough that is enough for making two sets of baked pastries. So now, you will use half of it for the sticky buns, and you can wrap up and freeze the other half to make another set of sticky buns. 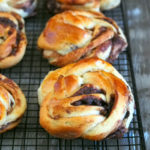 Or chocolate brioche. Or the cream cheese brioche. Or whatever you would like to do to it. I find it so convenient to have brioche dough in the freezer. Whenever I get the itch to bake, or when I have guests coming over, dough is ready and all I need to do is thaw, assemble and let it rise. Once you get the hang of making the brioche, I assure you, you are going to make it over and over again. So to get your system organized, let us break the sticky buns to it’s components. Sticky Buns: What is in them? 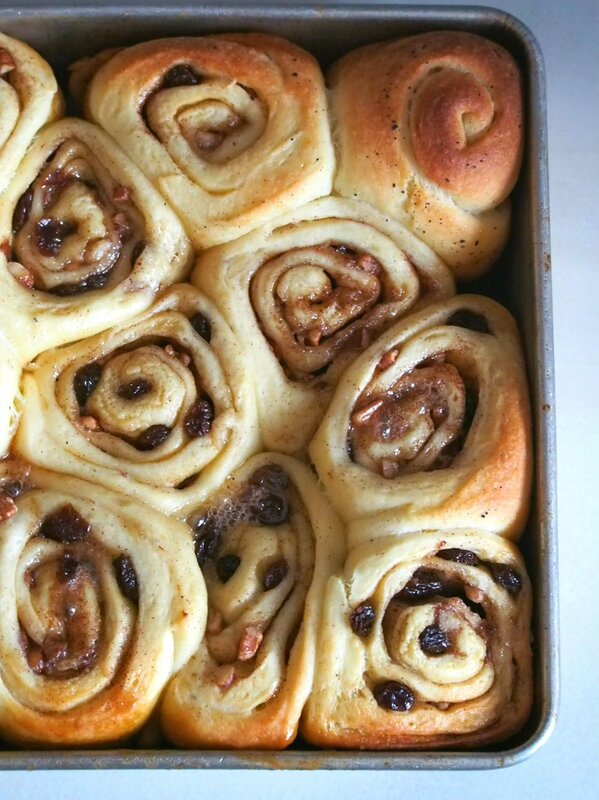 Brioche Dough– aka your bread or your pastry that is going to hold those delicious pecans and raisins, and gets slathered with the sweet, gooey sauce. 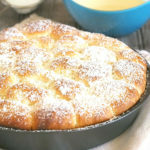 The brioche involves two steps, the sponge and the dough. I have included a step by step photo tutorial below the recipe box to illustrate the process. The Filling– this is made of cinnamon, brown sugar, a handful of toasted pecans and raisins that are soaked in rum. Don’t those sound delicious already? If you have pecans that are not toasted yet, check out this article on how to toast pecan nuts. 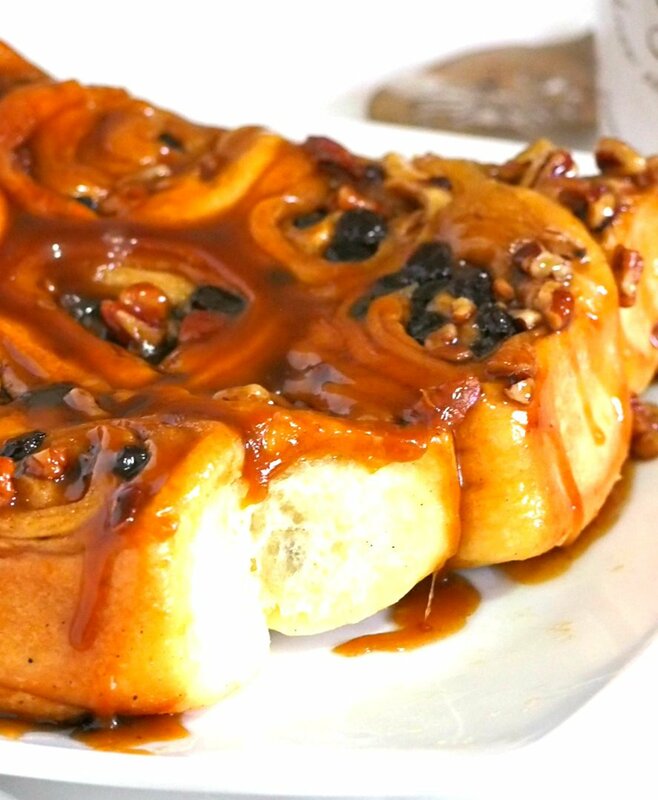 The Topping– this element is mostly responsible for the gooey, sticky and saucy personality of sticky buns. This is a delicious blend of brown sugar and softened butter spread all over the baking pan so that they become the top of the buns once you invert them. Believe me, the sight of the sticky sauce dripping down the sides of the buns is breath taking! The Glaze– you brush this on top of the buns after proofing, right before baking them. It is made of the rum-water solution that you soaked the raisins in, plus more butter. Every element makes these buns lips smacking good. Only 1/2 of the brioche dough is required for the sticky buns. You can freeze the other half for up to three weeks. Just wrap in tightly in plastic, then in foil. For your convenience, I highly recommend you make the brioche ahead. Since the dough is suitable for freezing, you can make it even weeks ahead. That way, the whole process will be cut down to the part of rolling the dough and it’s assembly. The pan I used is 8 x 2 inch square. And finally, the recipe! Be sure to check out the photo tutorial below to guide you through the process. Enjoy! 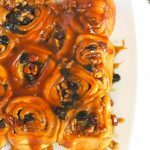 These sticky buns are cinnamon rolls made with brioche that is loaded with pecan nuts and raisins, and covered in a sweet and sticky brown sugar topping. Add the sugar, salt, eggs and 1 cup of flour to the bowl with the yeast mixture. Using a dough hook, run the heavy duty mixer on low speed for about a minute until the mixture is just about incorporated. Add the remaining half cup of flour and run the mixer in medium speed. Continue to beat, scraping the bowl as needed, for about 15-20 minutes. You will know when the dough is ready if it is coming together in the center of the bowl, and also attaching itself into the dough hook. You should see the dough slapping the sides of the bowl, like it is almost violently throwing itself to the sides white it still clinging and rotating with the dough hook. You should also hear the slapping sounds. Now add the butter bit by bit. Make sure that the butter is in in room temperature, but not warm or oily. When you add the butter, the dough will fall apart again for a moment. Continue to beat until you hear the slapping sounds again. This should take about 5 minutes or so. 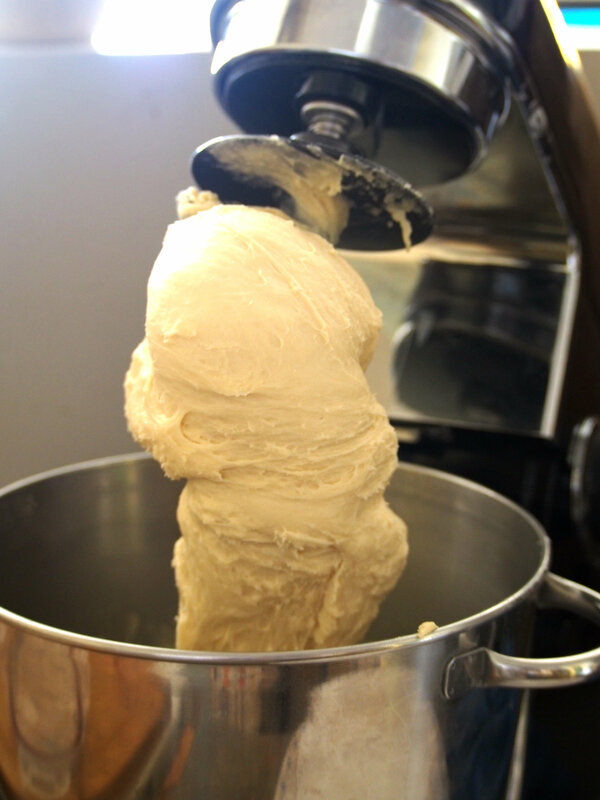 The dough is now , once again, clinging together in the center and in the dough hook with the slapping sound. Dough is sticky but shiny at this point. After the dough has doubled in size, gently deflate it by lifting and then letting it fall back to the bowl. Cover the bowl again with a plastic wrap and chill in the refrigerator for 6 hours or overnight. The dough will double in size again ( After the long chill, you can now divide the dough in half. Use 1/2 for the sticky buns and reserve the other half for future use. You can freeze the dough for up to three weeks, tightly wrapped in plastic and foil). In a small bowl, add raisins, 1/4 cup boiling water and 2 tbsp. dark rum. Cover and let stand for at least 1 hour. Meanwhile, combine sugars, cinnamon and pecan on another bowl. 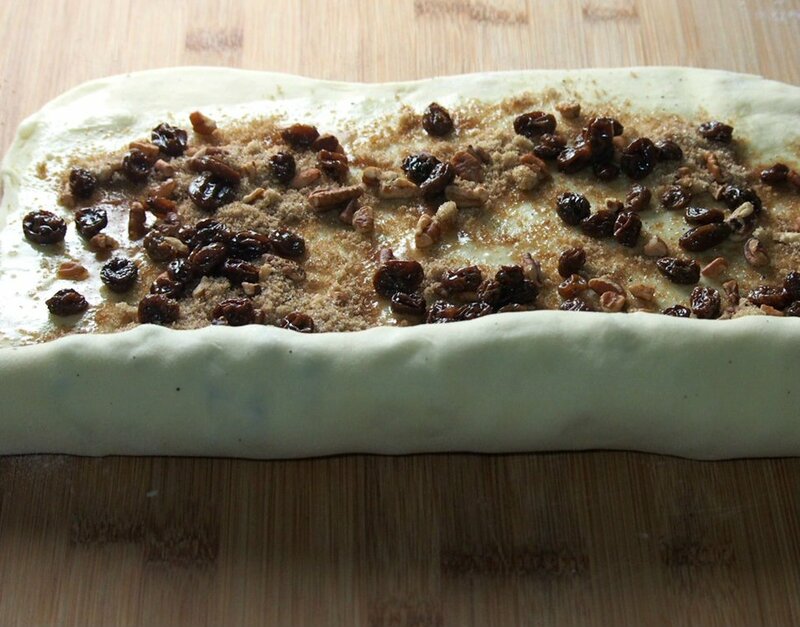 When ready to roll the dough, drain the raisins and set aside the soaking liquid. Stir together softened butter, sugar, and corn syrup until everything is incorporated. 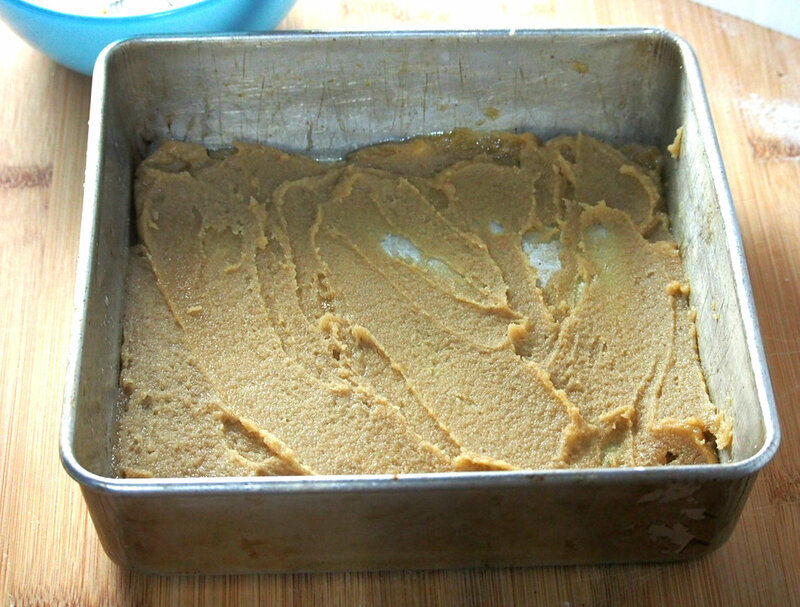 Spread this mixture evenly on a greased 8 x 2 square baking pan. Reserve about 4 tablespoon of the soaking liquid of the raisins and stir in melted butter. In a floured surface, roll the dough to a 14 x 12 inch rectangle. Brush the surface with beaten egg using a pastry brush. 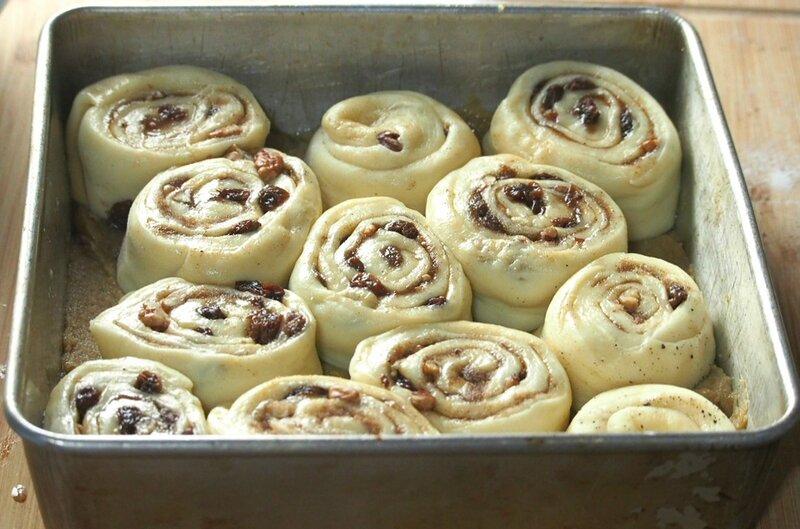 Sprinkle the cinnamon sugar mixture and the raisins all over the dough. Use your hands to spread it evenly. Roll the dough into a log starting on the long side. Press the seams to seal the dough. Cut the dough into 4 equal portions, then cut each portion to three equal portion to yield 12 cut rolls. Place 2-3 pieces of pecans on each of the cut end of the rolls, pressing them firmly to adhere. 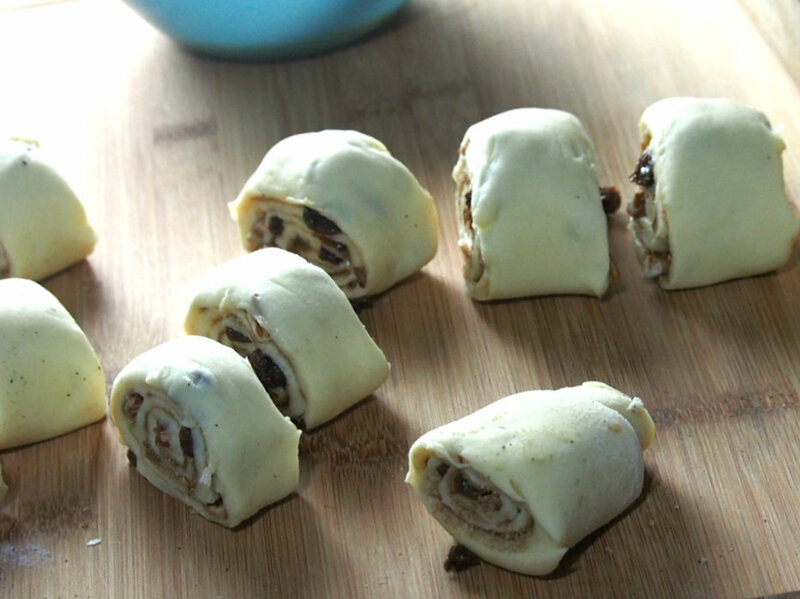 Place each roll with the pecan side down on the prepared baking pan. Space them evenly and when all rolls are positioned, press them down so they are more plump and their sides are touching. Let the rolls rise, covered loosely with plastic wrap for 2 hours. Place an oven rack in the lowest position of the oven. Pre-heat oven to 425 F ( 400 F if you are using a dark pan). Brush the surface of the rolls with the glaze using a pastry brush. Set the baking dish on top of a baking sheet and place in the lowest rack of the oven. Bake for 10 minutes then lower the temperature to 375 F. Bake the rolls for another 12-15 minutes or until the buns are lightly golden. To prevent over-browning, cover the buns loosely with foil after the first 7 minutes (during the 375 F stage). Let the buns cool slightly for a minute or two then turn it over on a serving plate. 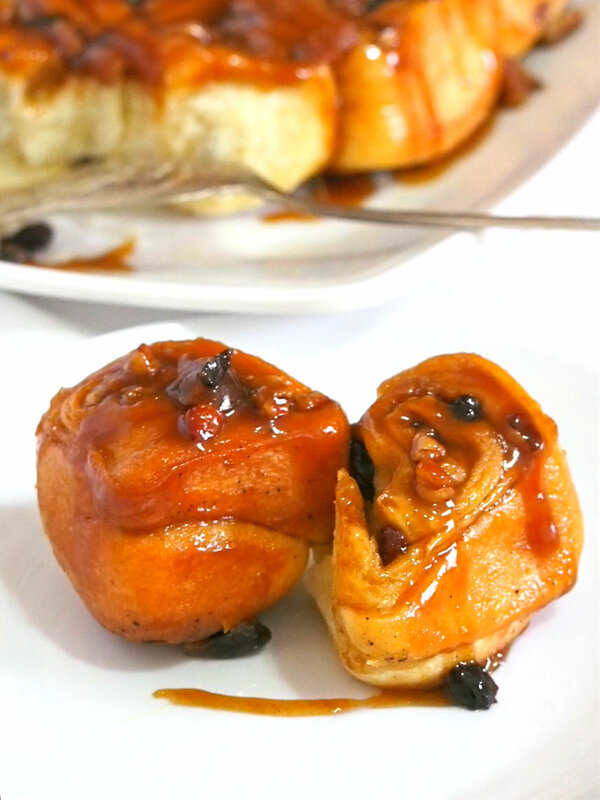 Sticky buns should be stored in a tightly covered container at room temperature. Re-heat leftovers in the microwave for 10-20 seconds. Brioche recipe adapted from book Baking with Julia by Dorie Greenspan ( recipe from Nancy Silverton) and the sticky buns assembly adapted from The Pie and Pastry Bible by Rose Levy Berenbaum. Preparation times does not include chilling and rising times for the dough. In the bowl of your stand mixer, add the 2 and 1/4 teaspoons yeast, 1/3 cup warm milk (heated to 110 F), 1 egg and 1 cup of flour. Use a rubber spatula to combine them. 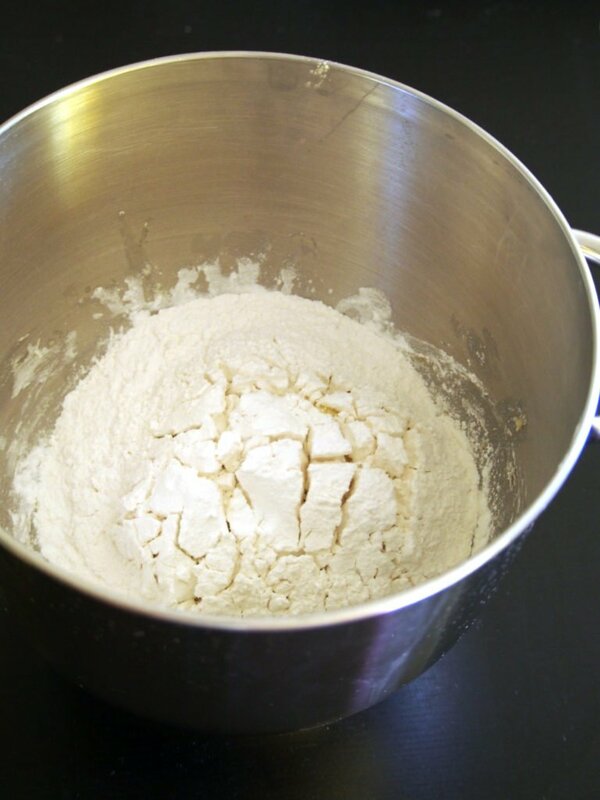 Add another cup of flour by sprinkling it on top of the yeast mixture to cover (do not stir). Let this stand untouched for 40 minutes. After that time, the flour should develop some cracks on the surface. Now add 4 lightly beaten eggs, 1/3 cup sugar, 1 teaspoon salt and 1 cup all purpose flour to the same bowl. 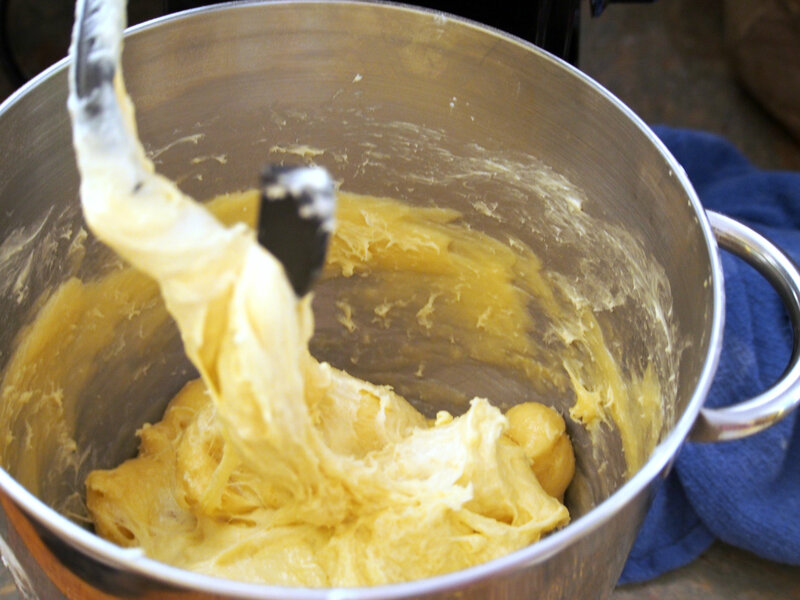 Attach the dough hook to your mixer and beat the mixture on low speed just until combined, about a minute or so. Add another half cup of flour and beat the mixture on medium speed for about 15 minutes. Stop the mixer to scrape the sides and bottom of the bowl if needed. 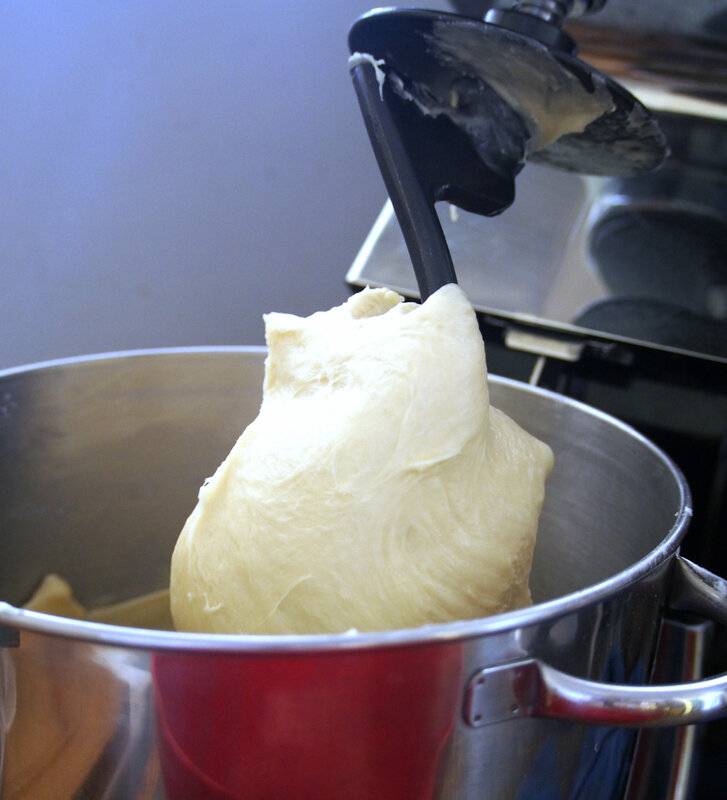 An indication that the dough is ready is when you see it gathering itself into the center of the bowl, and attaching itself onto the dough hook. As the mixing progresses, you will see the dough slapping the sides of the bowl. It is like the dough is throwing itself , almost violently, to the sides of the bowl but still clinging to the dough hook. You can hear the slapping sounds the dough makes against the bowl. You are now ready to add the butter. 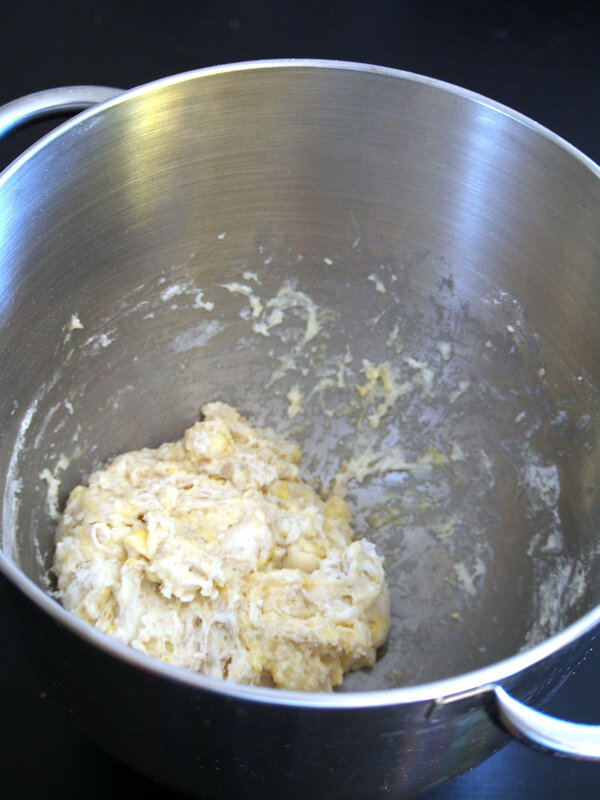 Bit by bit, drop the softened butter into the bowl, letting them mix well after each addition. Now at this stage, the dough which has gathered beautifully earlier, will start to fall apart again. Note that it is important that the butter is at room temperature upon adding them. They should be soft enough to blend in to the dough but not too soft that they are warm and greasy. I like to smear them or smash them with my fingers as I add them bit by bit. That way, they are just soft enough to blend in as you throw them in pieces to the dough. Continue beating and you will see the dough gather again, and make the slapping sounds once more. This should take about five minutes. At this stage, you will have a shiny, sticky and smooth dough. 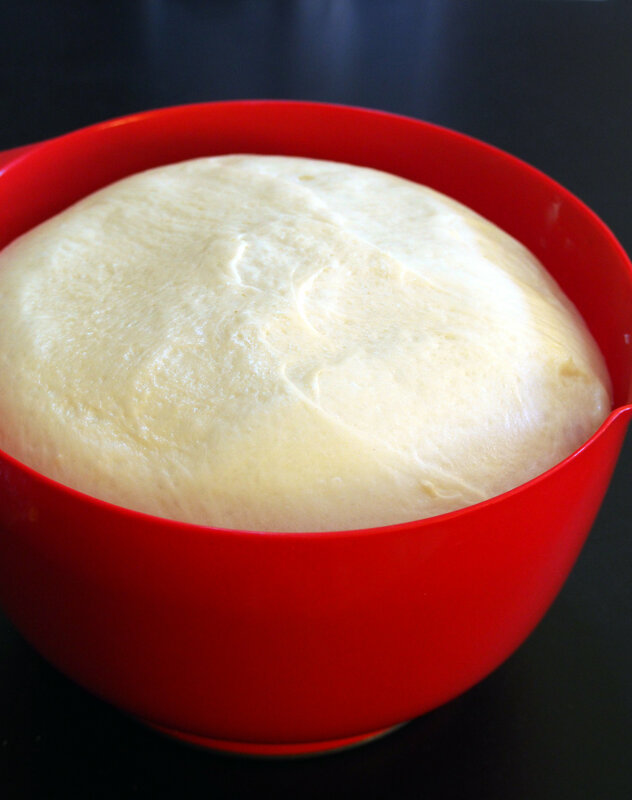 Place the dough in a large greased bowl, cover it with plastic wrap and let stand in room temperature until doubled in size, about 2 hours. After that, you are going to quickly handle the dough before the long chilling: Gently lift the risen dough from the bowl. Lift it in one part at a time, and let it fall back to the bowl. And again, cover the dough in the bowl with plastic wrap and refrigerate for 6 hours or overnight. After the long chilling, the dough is now ready to use. You can divide it to two portions at this point and freeze them or refrigerate for up to two days until ready to be used. Once the fillings and toppings are ready, roll the dough to 14 x 12 rectangle. Brush the surface with beaten egg using a pastry brush. 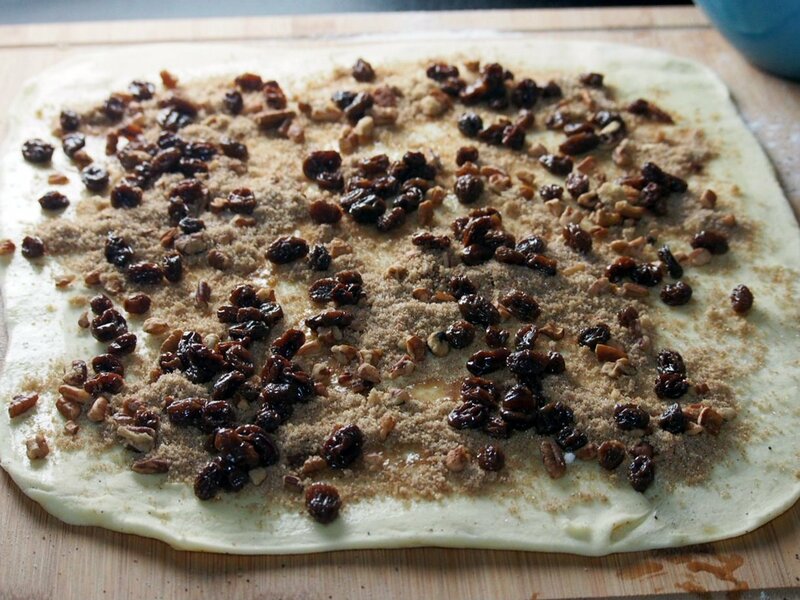 Sprinkle the drained raisins, cinnamon sugar and pecans over the dough and spread them evenly using your hands. Roll the dough into a tight log starting on the long side. Press the seams together to seal. Cut the log into 4 equal portions using a sharp knife. then cut each of the portions into 3 smaller portions to yield 12 rolls. Place 2-3 pecan halves on one cut end of each roll and place them pecan side down on the prepared baking sheet that has been spread with the topping. Once all the rolls are in the pan, press them down to make them plump with their sides touching. Let the rolls rise in a warm place for 2 hours, loosely covered with plastic wrap. Preheat oven to 425 F ( or 400 if you are using a dark pan). Place the oven rack in the lowest position inside the oven. Brush the rolls with the glaze and set the pan on a baking sheet. Bake the rolls for 10 minutes, lower the temperature to 375 F and bake for 12-15 more minutes until the surface is lightly golden. To prevent over-browning, cover the rolls loosely with foil after the first 7 minutes of baking during the 375 F stage. Remove from the oven and immediately turn over onto a serving plate.